A new year approaches—is your kid’s wardrobe ready? We love a fresh start as much as you do, so here are some fun, new and trend-right ways to bring great new styles to their closets—from play clothes to footwear to outerwear, 2019 has so many cool looks in store. The weather is still blustery in many parts of the country, at least until the groundhog sees his shadow. Make leaving the house with a jacket a bit more fun when you choose one with eye-catching pops of neon and a camo-lined hood. Finish off this mostly monochromatic look with a graphic tee, some chill kicks, and jeans faded just-so. The skies may still be cloudy, but it’s easy to bring some warmth (and style!) into their wardrobe when you brighten up the basics with pops of color. 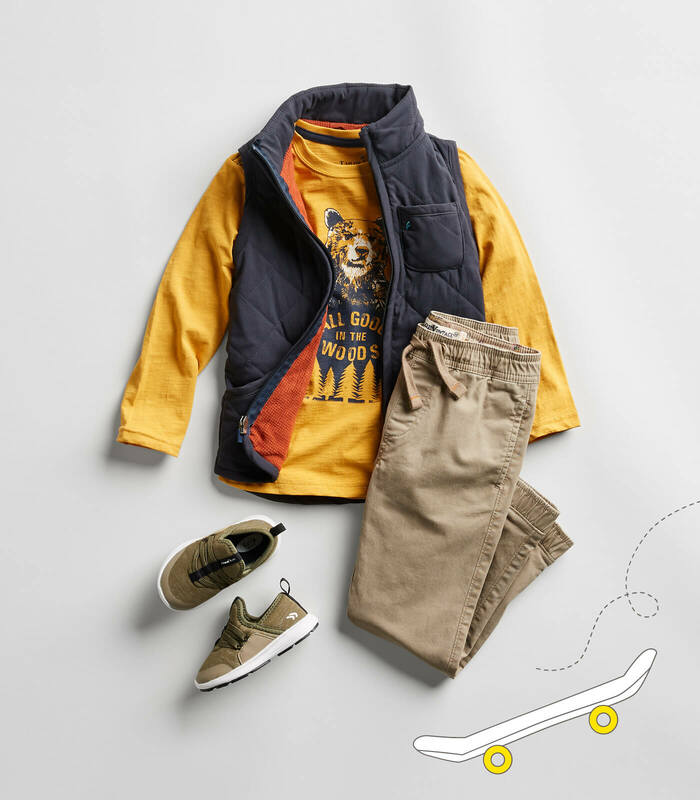 Versatile khaki pull-on pants and tech-y sneakers are punched up with the addition of a golden yellow graphic tee, and a navy vest with an orange lining—a little color inspiration takes them into spring. 2019 brings so many fun trends, including a plethora of prints and patterns made for mixing and matching. Nothing says “mini-fashionista” like combining stripes and leopard print, and we love this grrrr-eat jacket with a cozy attached hood, worn over a striped, graphic tee. Pick up the t-shirt’s accent color with side-striped pants. Add kitty-cat shoes into the mix, and you’ve got a year’s worth of trends in one adorable outfit. 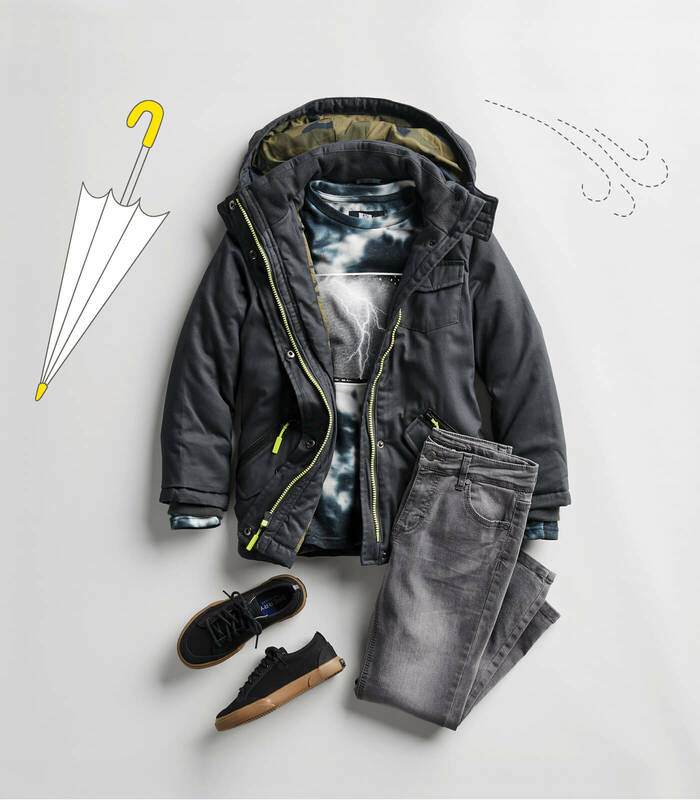 Kids and color is a natural combination, and we’re always looking for new ways to add pops of bright hues to their closet. Graphic tees are big again in 2019—and adding an animal motif makes it just that much better. 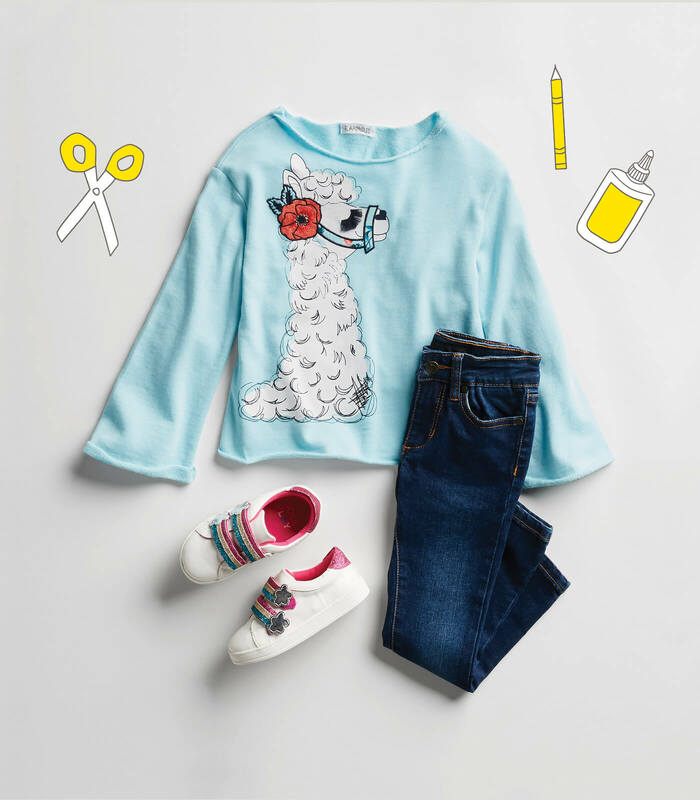 We love this pretty llama paired with shoes adorned with stars and rainbow stripes—just the thing to make her jeans perfectly on-trend. Ready to up your kid’s trend-quotient for the new year? Ask their Stylist for the newest prints, patterns, colors, fabrics and more.